The Sidewinder (Crotalus cerastes) is a venomous pit viper snake species found in the desertic regions of the southwestern United States and northwestern Mexico. In the US they are found in desert regions of eastern California, southwestern Utah, southern Nevada, and western Arizona, and in Mexico, it's found in western Sonora and eastern Baja California. They belong to the genus Crotalus, that of rattlesnakes and 3 subspecies are currently recognized by scientists. They are also known by other common names like the horned rattlesnake, sidewinder rattlesnake or sidewinder rattler. The sidewinder inhabits mostly with wind-blown sands, particularly where sand hummocks are topped with vegetation. But they are also found in areas with open terrain which enables their sidewinding locomotion like open flats, hardpan, and rocky hillsides, and other arid areas usually with creosote bush growth. Their most common name, sidewinder, comes from the snake's unusual form of locomotion, which enhances traction and makes possible its movement on loose windblown desert sand. However this peculiar locomotion is used by the sidewinder on any substrate and as the snake progresses over the loose sand it leaves a J-shaped impression, with the tip pointing in the direction of travel. This is a small rattlesnake species, on average adult specimens measures between 17 and 30 inches (43 to 76 cm) in length, males are smaller than the females, which is unusual for this type of snakes. ​The sidewinder pattern consists of a ground color that may be yellowish-brown, cream, buff, pink or grayish, overlaid with 30 to 46 dorsal elliptical or rhombus shaped blotches. Like other rattlesnakes the sidewinder as a thin neck and a very distinct large triangular head, their tail is thick with the obvious rattle. ​The belly is white and they have the capability of displaying a different coloration depending on the ambient temperature in a process known as metachrosis. They have keeled dorsal scales and because of the raised supraocular scales above the eyes, they are sometimes referred to as the horned rattlesnake. This evolutionary adaptation may help the snake shade the eyes from the sun or possibly prevent sand from drifting over them as the snake lies almost totally buried in it, in ambush waiting for prey. The sidewinder is active from November to March, maybe longer in the southern part of its range, but during hot months the snake is nocturnal and becomes diurnal during the cooler months. In captivity, they have lived between 20 to 30 years, but in the wild, they probably don't live that long. There are 3 subspecies currently recognized by scientists. Sonoran Desert sidewinder (C. c. cercobombus - Savage & Cliff, 1953) - Found in the US in Maricopa, Yuma, Pima and Pinal Counties in Arizona and south into Sonora, Mexico. 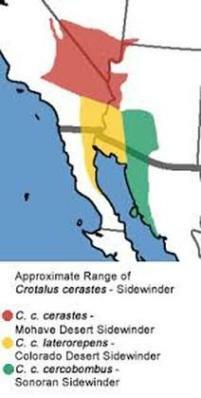 Colorado Desert sidewinder (C. c. laterorepens Klauber, 1944) - Found in the United states inhabiting desert areas of Riverside County in California to Pinal County in Arizona and south to Sonora and Baja California in Mexico. The sidewinder is a venomous snake, but the species possess a much weaker venom when compared to other rattlesnake species. Its venom is about 16 times less toxic than that of the Mojave rattlesnake (Crotalus scutulatus). This fact combined with their small size venom glands, makes the sidewinder less dangerous to humans than their larger relatives like the eastern diamondback rattlesnake. The bite symptoms include nausea, chills, coagulopathy, dizziness and shock, and can cause pain, swelling, hemorrhagic bleb formation and ecchymosis. The Sidewinder like most rattlesnakes is an ambush hunter, it stays coiled and waits for unsuspecting prey to approach within striking distance, then strikes and releases the prey. It uses its hollow retractable fangs to inject the venom and kill the prey and also to begin digesting it. The snake follows the trail of the envenomated animal and swallows it whole. They feed on lizards, mice, birds and even other snakes. The juveniles sidewinders use their tails to attract lizard prey in a behavior called "caudal luring". The adult specimens gradually lose this behavior when they make the transition from small lizards to their primary diet item, desert rodents. The mating season takes place in the spring from April through May, but they do on occasion mate in the fall. Like all rattlesnakes they are ovoviparous. Females give birth to live offspring in clutches of up to 20 young are born in July or August. The young snakes range from 6 to 8 inches in length, they are born inside a thin membrane from which they break out within just a few minutes after birth. The hatchlings will stay with the female in a burrow for a week up to 10 days, after shedding for the first time, they abandon the burrow and are ready to fend for themselves. Unlike most snake species, which give no parental care, during this short period the sidewinder female guards and protect the young snakes from predators. Sometimes the females dies of sheer exhaustion after giving birth, which may last 2 to 3 hours. When they are born the younglings have only a single rattle button at the end of their tail. The sidewinder rattlesnake matures at 2 to 3 years of age and reproducing annually, but might not reproduce for 1 o 2 years if the food supply is scarce. The sidewinder is currently classified as Least Concern species on the IUCN Red List, it's listed as such due to their wide distribution and presumed large population. In the last assessment done in 2007, their population trend was considered stable. A group of snakes is called a bed, den, pit or nest, find more facts about snakes for kids.